LingoHut Blog: Hmm, which language should I learn? How to figure out what language you should learn? Polyglots are always looking for a new language to learn. Many polyglots ask, which language should I learn next? Instead of asking why don’t you experience it for yourself. Here is a fun idea to see if the language fits you. How about going to a theater play in the language you are thinking of learning? You do not have to understand the context of the play; what you need to pay attention to is how the language makes you feel. Before I wrote about this novel idea, I decided I wanted to put it to the test. This weekend a friend of mine was in a Hindi play, and I thought to myself this would give me a perfect opportunity to see if this idea works. I sat for two and a half hours listening to the language without understanding the meaning. I listened closely to the language and how my senses felt toward the sound, inflection, and tones. 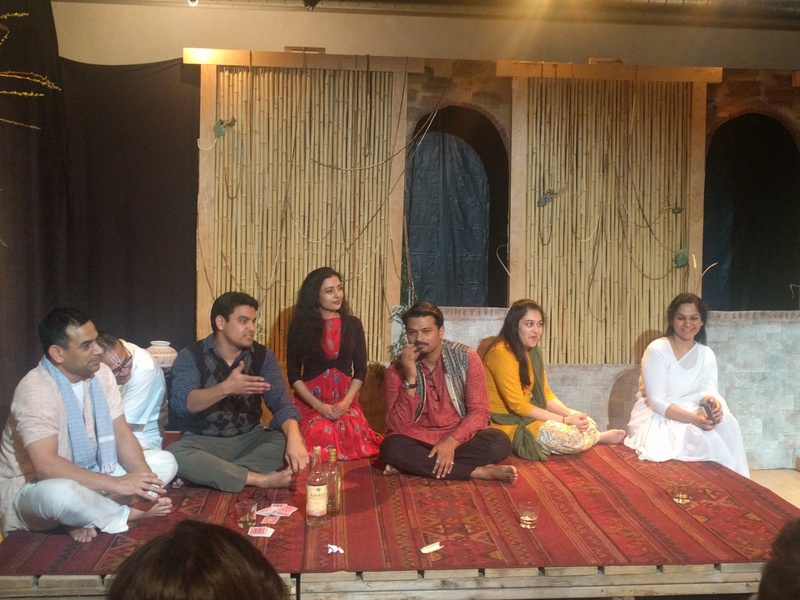 I must tell you I had never had the interest to learn Hindi, but after the play, I am curious. In all fairness, I must share that I read the cliffs notes (found below) of the play before watching it. The cliffs notes gave me a little knowledge about the meaning of the play. I was out of my comfort zone during this activity, for sure, but I did not mind it at all. What I discovered was that this activity helps determine if a specific language might be right to learn. It would be a shame to spend precious time learning a language to find later out that you do not feel the love you thought you did for the language. As most of us know learning a language takes time, lots of time and dedication. Time is precious; you only get to use it once, just like money. Use it wisely!! It is worth getting out of your comfort zone to determine if something is right for you. Are you looking for a language to learn? Head to a play in the language you are considering learning. Get out of your comfort zone. Here are the cliffs notes of the play and a few videos for you to get a firsthand feel for this activity. 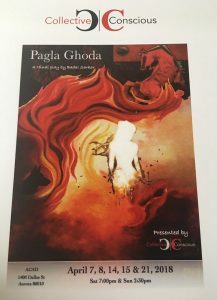 Pagla Ghoda is a tale of love found and love lost, set against the backdrop of a cremation ground; four men gather to unveil the mystery of the girl burning on the pyre. Reminiscing about their own lives, each discovers the power of love that still haunts them. 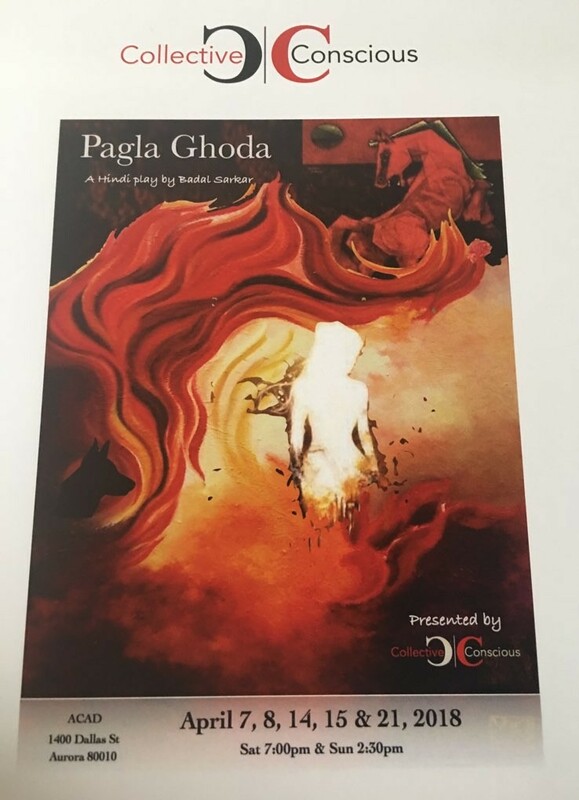 Pagla Ghoda is a multi-layered, abstract play. As the play opens, we see four men sitting on stage drinking whiskey and playing cards. This is the waiting area at the cremation ground, rustic, dilapidated, according to Hindu traditions dead bodies are taken to open cremation grounds where they are burnt on open pyres, once the body turns to ashes, remains are collected and immersed in river Ganges so the soul may achieve Nirvana. Satu the contractor, Shashi the postmaster, Kartik the compounder/chemist and Himadri the school teacher have brought this young girl at the request of Malik babu who also provided the 2 English whiskey bottles as a bribe, so these 4 men could quietly take the dead girl in the middle of the night and finish the cremation rites. All four are trying to figure out the mystery behind her death, Shashi, Himadri, and Kartik know a little bit about the girl but not the whole story. As they are talking about her, the ghost of the dead girl appears in the doorway; she talks to the men, coaxes them to tell their own stories, the women they once loved but lost. Keep in mind that all the women you see in the play are dead. They either appear as ghosts or in flashbacks that the men lapse into as they get drunk. Under the influence of alcohol, memories, and emotions well up, Shashi remembers the night when Malti had come to him pleading that she could not marry Pradip, her fiancée because she is in love with Shashi. Shashi tries to convince her to marry Pradip fully knowing that Pradip is an abusive person and can go to any length to make Malti’s life a living hell! Shashi is worried about society and proper behavior and goes against his own love and desire for Malathi by essentially turning her away and leaving her with no choice but to marry Pradip. He remembers the second night she had come after her marriage to Pradip, angry she blames him for her misery; she shows him the scars of how Pradip has tortured her by heating the silver knife and burning her. Shashi is distraught and is overwhelmed with guilt and remorse. He tells his story, repenting that he could not save Malti, who died by burning herself, effectively committing suicide to escape her hellish life. The first act ends with Shashi under the influence of alcohol unburdening himself to his friends and acknowledging basically how his own life is now ruined as well because he is no longer capable of finding and keeping love. While the first Act primarily unveils Shashi’s story, it also sets up via banter between the drinking men their own personalities and some clues into the Girl’s life. Satu, for instance, reacts very negatively to a dog’s barking because it plays a critical role in his story. Himadri’s principles do not let him imbibe alcohol which is also a big factor in his estrangement with the girl he loves. However, as he gets into the spirit of things, you see him become curious about alcohol and actually try some towards the end of Act 1. Kartik, comes across as a happy go lucky guy and a hopeless romantic, or is he someone with nothing left to lose? The second storyline is that of Himadri, who teaches Mili’s younger brother as a live-in tutor. Mili and Himadri fall in love, but the disparity between their lifestyles is like a chasm that cannot be filled. Mili’s father is a rich and affluent man in the city of Calcutta, Mili has a western lifestyle which includes partying and drinking with her friends. Himadri does not like this and wants to change her according to his beliefs and thinking. Mili is willing but is struggling to adapt to Himadri’s way of thinking. Himdari finally after two years of trying to change her gets fed up and resigns from his duties as a tutor. Mili is distraught but is not successful in getting Himadri to change his mind. As they part, she threatens Himadri that she will drink and keep on drinking until she dies! Himadri leaves to live a simple life in a village only to learn that Mili died in a car wreck while driving drunk. After having drunk for the first time in his life, Himadri’a belief system crumbles, and it culminates in an emotional drunk scene where he breaks down while relating his story to his friends and insisting that Mili’s death had to have been an accident and not a suicide. It is clear though through his breakdown that he fears he might have played a role in putting Mili in a situation that led to her death. A heavy burden to bear. Satu, the contractor, is a happy go lucky guy. He ran away from home when he was about 15 and made his own way in life. He has learned that relationships are baggage and lives his life accordingly, finding that it is much better for him to meet his physical needs in houses of pleasure or among the laborers he often has to hire for his general contracting work. But even within Satu lies a streak of compassion that drove him to rescue a prostitute called Lacho from the company of some really bad folks who were abusing him. He kept her with him for a period where he got comfortable with her and even may have had some relationship with her. She had adopted a stray dog which had a great deal of affection for her but never quite took to Satu. She, of course, was very grateful to him and took care of him and his household as a servant. Ultimately though he worried that folks would refuse to give work to a man who kept a woman of ill repute in his home. He thought he found the perfect solution when he managed to find employment for Lacho in the household of a well to do personally as a servant. Unfortunately, that person ends up taking advantage of her and also passes her around among his friends for their entertainment. Lacho desperately comes to Satu late one night asking him to take her in. Again, he worries about his own employment and turns her away. Lacho withers away under the misuse and ultimately dies of an unspecified disease. When he heard she was sick, he went to the hospital but was too late. She was in the morgue with only the dog sitting by her body to guard it. It attacked him and he is furious at the dog, but it probably assigns the blame for its mistress’s death to him turning her away. Finally the enigmatic Kartik. He begins to reveal his connection with the girl. It turns out she used to visit him at the clinic, and he developed a great infatuation for her. He was a very lonely but shy man and never did get the courage to let her know. She took over his mental peace and permeated every thought. At some point, she was married off to a mentally disabled man because the guys family was told that he would become ok after marriage. It was not by her choice; all she had was a very sick dad and no means to take care of herself. The disabled man was never to be seen after her marriage, and she was just trapped in her in-law’s place. After three years she escaped and came back to her sick father’s home. The rich man Malik had kept the old man alive in the hope the girl would one day fall into her clutches. While it is unspecified whether anything happened between her and the rich man, the underlying theme for this play and her life is that she has never experienced the power of love and feels very unfulfilled in her life. She visits Kartik in his clinic and asks him for poison so she can end her life. He refuses to give it to her and requests her seven days so he can muster enough courage to let her know her true feelings. The girl goes away and ends up hanging herself as she cannot even fathom any point in going on. The girl’s cremation is almost complete, and the other three men leave with Kartik remaining behind to finish a little bit of the whiskey left. This is when the big reveal happens. While he refused to give poison to the girl, he has brought it for himself to end his life as he truly had built this incredibly rich imaginary world with the girl in the center and now everything has collapsed with her gone. As he prepares to die by poison, the girl’s ghost finally realizes that she too had had someone in her life who had cared deeply for her. She begins a frantic effort to reach across into the real world and stop Kartik from dying. Somehow the love that has finally touched her allows her to reach Kartik and reminds him of his own words to her and everyone else throughout the play, “Anything is possible while there still life.” Kartik changes his mind, and the play ends on a positive note that life must go on. Q&A after the play. Awesome experience!